A European Parliament vote on a resolution seen as extremely critical of Russia has allowed the painting of a very precise picture of which countries have the most pro- and anti- Russian MEPs. The Vote Watch website allows us to see exactly how each MEP voted and who the “rebels” are. The Parliament passed on 23 November the very polarising “EU strategic communication to counteract anti-EU propaganda by third parties”. 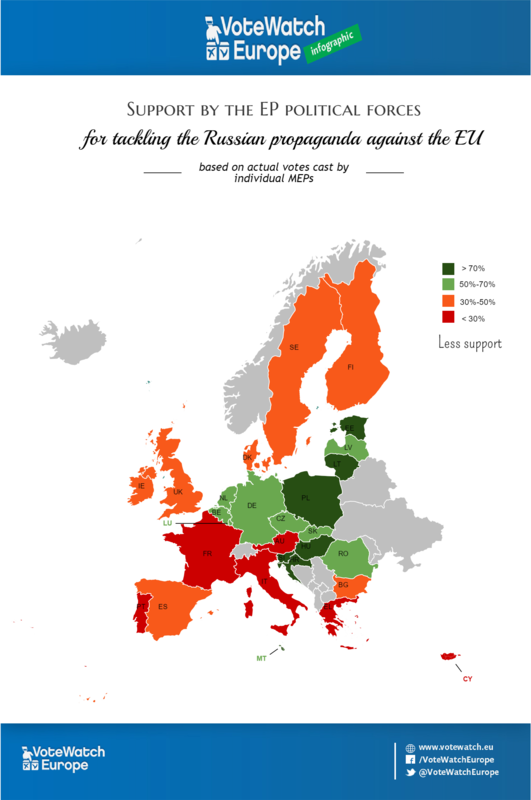 The resolution, based on a draft by Anna Elżbieta Fotyga (PiS, Poland) doesn’t focus exclusively on Russia (it also speaks of the propaganda by Islamic State), but it generally mobilised MEPs in two camps – those who supported the view that Russia pursues hybrid warfare aimed at destroying the EU, and those who thought such language can only be counterproductive. The vote was passed with 304 votes “For”, 179 “Against” and a very high number of abstentions – 208. Without any doubt, the southern part of the EU rejected the resolution. 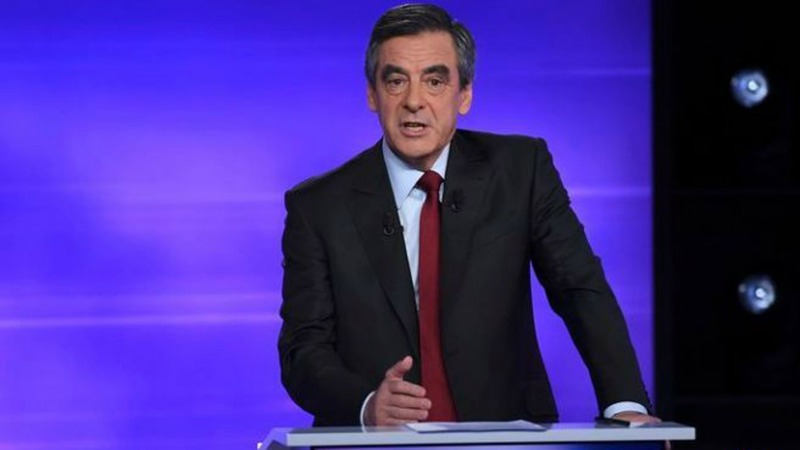 Many parliamentarians voted according to national lines, especially in France and Italy. Only three French MEPs out of 68 present, and only eight Italian MEPs, out of 69 present, supported the resolution. From the Greek MEPs, out of 18 present, not a single one supported the resolution. Only six out of 20 Portuguese MEPs voted “For”. In Bulgaria, a traditionally pro-Russian country for historic reasons, all socialist MEPs voted against, despite the position of the S&D group to abstain; all MEPs from the mainly Turkish party DPS abstained, which is also considers a “rebel” attitude vis-a-vis their political group ALDE who advised to vote “For”. All EPP-affiliated MEPs voted “For”, according to the position of their political family. Overall data for the 28 countries show that the centre-right EPP group voted mostly in favour, but still had abstentions, especially from France and Italy. Most of the overall S&D vote followed the instruction of their political family to abstain. An S&D source told EURACTIV that the reason was that the group didn’t like mixing the issues of Russian and Islamic State propaganda in the same resolution. The anti-European Europe of Freedom and Democracy group, chaired by Nigel Farage, voted massively against the resolution. The far-right group of Marine Le Pen, “Europe of Nations and Freedom”, was even more united against the text. 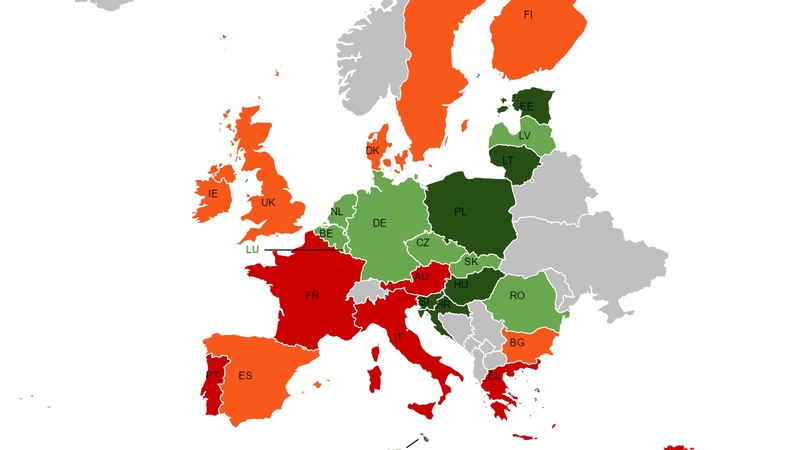 On the other hand, Central and Eastern Europeans, as well as Germans, Belgians and Dutch were highly in favour of the resolution, in range of approval between 50 and 70%. Even Viktor Orbán’s party, Fidesz, voted in favour of more action in countering anti-EU propaganda. Clearly the strongest pro-resolution vote (more than 70%) was expressed by MEPs from Poland, Lithuania, Estonia, Hungary, Croatia and Slovenia. The votes by countries and political groups, as well as the individual votes can be accessed here. This smacks of beiing an attempt to overrule populism aka democracy. What is that supposed to mean? The majority supported the resolution. It really doesn’t say anything other than one groups support for or against another nations perceived hybrid warfare. This is utterly rridiculous !!! Russia is Not against the EU ! Europe has tied itself in lockstep with Wahington DC Foreign Policy . Under Obama’s presidency the US has decided upon a series of Regime changes , that have been supported without question by the EU . When Yanukovych failed to sign a free trade accord with the EU ; the US , Victoria Nuland took it upon herself to activate a regime change , to put in place a president and government willing to cooperate with US plans for Ukraine . Ukraine would become a member of NATO , a US/Ukraine company would extract natural gas , The US could place missile defences on the Russian border , the US/NATO fleet could replace the Russian fleet at Sebastipol , Crimea . Nobody understood that a little over half the Ukraine population was Russia supporting ; the people of the eastern region refused to cooperate , the army was sent to make them and civil war began . Without the civil war , urged on by the US , Russians would not have come to support the separatists and further , neither would MH17 have been shot down . Russia felt its own security at risk , hence its taking back Crimea , that was predominently Russian populated . Without any hard evidence , from the beginning , Russia was blamed for the shooting down of MH17 before any enquiry . The US , slapped sanctions on Russia and ordered the EU to do the same . When the EU is clearly an enemy , what is Russia to do , sit back and say sorry . From the beginning the US/EU have been in the wrong and are now continuing to be in the wrong ; simply because if world power says you must , you must , no argument . Europe has put itself on the wrongs side , backed and become one of the bad guys , but fails to see or admit it . The EU takes great exception to the European public having access to news report that shows that Europe media peddles a bag of lies and the EU is seen to be wrong . Russia is not against the EU? So… tell me, why is Russia leading propaganda war against EU? Why are anti-EU and far right parties across all Europe financing by Kremlin? My country was under russian occupation for decades. We know exactly what russia is doing. Will there be a time in which the EU MEP windbags will be doing something helpful with all the EU pay that they are receiving? Jeesh. What a bunch of assholes. Stop complaining about others and start adding some value for Europeans citizens..
our press is at least as biased as the Russian press. it led us to war in Iraq, Serbia and Libia. In Iraq it was the weapons of mass destruction, in Serbia the genocide of Kosovars — Cohen, the USA minister of defense spoke of 100000 Kosovars killed by Serbian paramilitary forces, while the UN, looking for corpses after the war ended found a total of slightly more than 2000 (serbs included, before and after the NATO bombing), in Libia the accusations, later found false, of Gaddafi’ looking to kill Bengasi rebels. Our press lies, lies, lies. What surprises me most are the Germans MP. Aren’t they interested in a peaceful relation with Russia? Are they looking to enfeeble it so as to better exploit her resources? It was a shameful act. Most reasonable people in Europe do not recognize themselves in this Parliament.